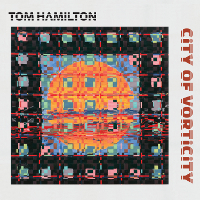 Tom Hamilton’s electronic environments are brilliantly colored, immersive structures but more than that, they are contexts—contexts for listening and for interaction with instrumentalists in real time. For nearly 40 years, Hamilton has been using analogue synthesizers to build settings within which improvisers playing acoustic instruments can interact. These environments are textural constructions made up of layered elements, each of which is a vortex of sound rotating around an independent axis. Individually and collectively, these sound objects are structured by rapidly pulsing, irregular and asynchronous rhythmic cycles that give the environment a quality of perpetual, recurrent motion. The resulting overall textures tend to be dense, but even during sparser passages there are always several sound elements in play simultaneously—a complex weave of strands of varying thickness. Taken alone, as it is on the second of this release’s two long tracks, the environment envelops the listener in its asymmetrical, divergent patterns whose beginnings and endings often defy expectations. When set out in conjunction with live accompaniment—as it is on the first track—its significance subtly shifts as the listener’s attention is continually directed toward and away from it as it accommodates and alienates the adjacent instrumental sounds, sometimes absorbing them and sometimes throwing them into plain relief. The challenge for the accompanying musician is to integrate the discretionary choices open to the improviser with the interlocking structures of the electronic background; fortunately the three soloists here—Al Margolis on violin, Alan Zimmerman on percussion and prepared dulcimer, and Peter Zummo on didgeridoo and trombone—always seem to find the right points of entry and exit as they play off of the surrounding electronics with the appropriate rhythmic and timbral abandon.